Wee Kitchen: Did someone say zucchini? The oven has been a little bit cold this week...as well as the weather. For the past four days we've had wind, rain and temperatures no higher than sixty degrees. Definitely time to bake something. For me, baking not only warms the house...but it warms the soul. No chicken soup for me. I wanted a quick bread...so since zucchini were on sale, I had an easy match....zucchini bread! I searched through some recipes in books and on the web and found a few I liked, but in the end I used a combination of the recipes...so I guess I can call this one my own. Butter and flour two loaf pans. Preheat oven to 350 dregrees. In a large bowl, mix together the eggs, sugar, vanilla and oil until well combined. In a smaller bowl, combine the flour, cinnamon, pumpkin pie spice, baking powder & soda and salt. Fold the zuccini into the egg mixture until combined. Fold the flour mixture into the egg & zucchini mixture and fold until just combined. Pour batter into two loaf pans. Bake for approximately 40 minutes. I had only one loaf pan, so my remaining batter went into a muffin pan. I need to get off this muffin kick! The bread and muffins are extremely moist - as you can see from the picture. The addition of lemon zest and the substitution of light brown sugar give this bread an added dimension of flavor. I really like the way it turned out. I think next time, I might even add a little maple extract in place of the vanilla. I love zucchini bread, it's one of those things I can just eat and eat. It's a fantatic way to have zucchini. Your zucchini bread looks great! This sounds absolutely delicious. Love your site, btw! Looks delicious, Elizabeth! I'll have to try it- a good way to get the mob some greens!! I'm not brave enough to start combining recipes, though! Im so glad to have found another baker! 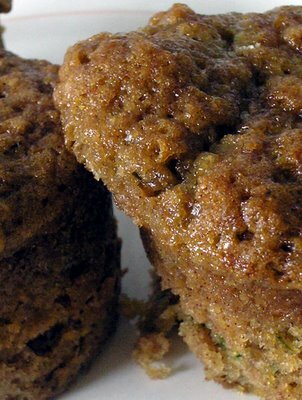 Your creations are awesome, and this zucchini bread looks so inviting. Nice blog. Fresh zucchini bread definitely beats chicken soup in my book. Looks like I'll be baking this weekend. Cheers!